There’s a host of reasons to rent deskspace rather than taking on a traditional long-term lease. There’s no doubt these can be a great option, but the lengthy contracts (usually of several years) can be prohibitive. Managing your own property can also be riddled with hassle. You get your broadband, utility and building maintenance fees included in one simple monthly fee. The all-inclusive nature of these packages means you don’t have to spend time managing a building, which can be a hassle when you want to focus on your venture. As a result this can be a particularly good option for startups. It pays for a new business to be flexible and the rolling month-to-month contracts these options tend to offer will deliver just that. This also makes them a great option for any business in need of temporary space; whether you’re taking on extra seasonal workers or are in a transitional period. Finally, when you’re renting deskspace, arguably the best thing about it is the buzz in the office. It can be really inspiring and something that motivates you to produce your best. This is particularly true for shared offices and coworking schemes, where people are often all together in the same room. Serviced offices do come at a higher price than other deskspace options. However, you’re paying for everything to be taken care of for you; in a serviced office everything is turned up to 10 in terms of professionalism. 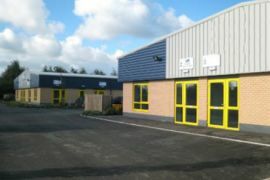 The efficiency, and even the image, of your business could be really boosted in such swish surroundings. The time many ventures could save having everything taken care of could be worth the money. This makes serviced offices a particularly great option in you’re cash rich but time poor. 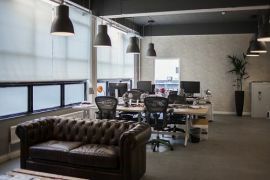 If you’d like a bit more privacy, many serviced offices do offer whole rooms to businesses, so you can have your own self-contained office within the larger building. Some properties will even allow you to customise your area by adding your own colour scheme and/or logo. 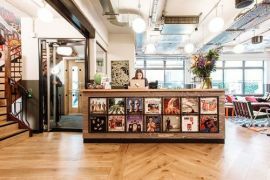 Shared offices are particularly abundant in the capital, or anywhere with a high percentage of exciting, creative businesses, digital agencies and online ventures. They’re generally the cheapest way to rent deskspace, which means they could well be the answer in your search for cheap commercial property. Interested? You can find our shared offices right here. If you like the all-inclusive nature of a shared office, but don’t like the idea of sharing with another business, then why not go coworking? 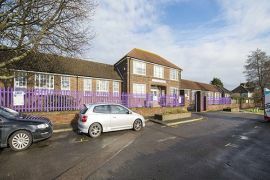 It’s another super option if you want to rent a desk and you can find these properties amongst our shared office listings. Space in these centres generally gives you access to more facilities than a shared office, with meeting rooms and phone lines more often included in your monthly fee. Because they’re specifically-designed to provide desks, you’ll be pretty well looked after. If the internet goes down most places have a staff member who can fix it, for example. They’re also perhaps the most collaborative and social of your options – few places better ignite a creative spark than a coworking office. Many offer ‘extra-curricular activities’ such as Friday afternoon drinks, which are a great way to boost the relationships with your fellow workers. This can only help if you want to get collaborative come Monday morning. …have a look through our checklist and our example search below. If none of thes issues raised seem like they’d be a problem for you and your business, then deskspace will probably be for you! You might have to leave your tech in a space you won’t get to lock yourself. In a serviced office you may be able to lock your own room. Any potentially sensitive data will be sent through a shared network. You won’t get control over the design of a property. In a shared office there’s also the (usually small) risk your hosts may need the desks for themselves and you could have to leave. If you’d like to find yourself some deskspace, you can search right here on Office Genie. Simply enter where you’d like to rent a property and search away. If you’re looking in the capital this can be either a street name such as Dean Street, postcode such as EC1 or even an area of the city such as Soho. If you want to be more specific you can also search for a certain number of desks and even enter your ideal spend. If you are on a tight budget do remember the cheapest properties are often a little further away from the most desirable locations. So, expand your search radius with our ‘Distance’ tool and see if you find a bargain. Or, have you got spare desks in your office? If so you can put them up for rent on Office Genie, completely free of charge! Why let space go to waste when you could lease it out and make money? You can advertise your deskspace using our online wizard. Alternatively if you’re still thinking about it, why not give our Desk Rental FAQs a look? It could help dispel any doubts you may have. Make sure to check out our guide to the legal issues surrounding desk rental if you’d like to check out any potential legal issues you might forsee.